I have made four of these ice cream cakes in the past week and this is the best picture I have managed to get before the cake was cut into and devoured. They are just too irresistible to expect folks to leave it alone long enough to photograph – especially to Jordans…and teenagers….and boys….and girls…..and adults….and you get the point. It’s the perfect blend of crunchy cookies, creamy ice cream, gooey chocolate syrup, light and fluffy whipped cream, and magical magic shell. The one above was supposed to be the ice cream cake that I got to take time with, setting up the perfect photo, etc. But then my son decided to meet some friends on his birthday for pizza and a movie and I found out at the last minute that he thought I had made this cake to bring for their dessert so I had to switch horses and go with that. 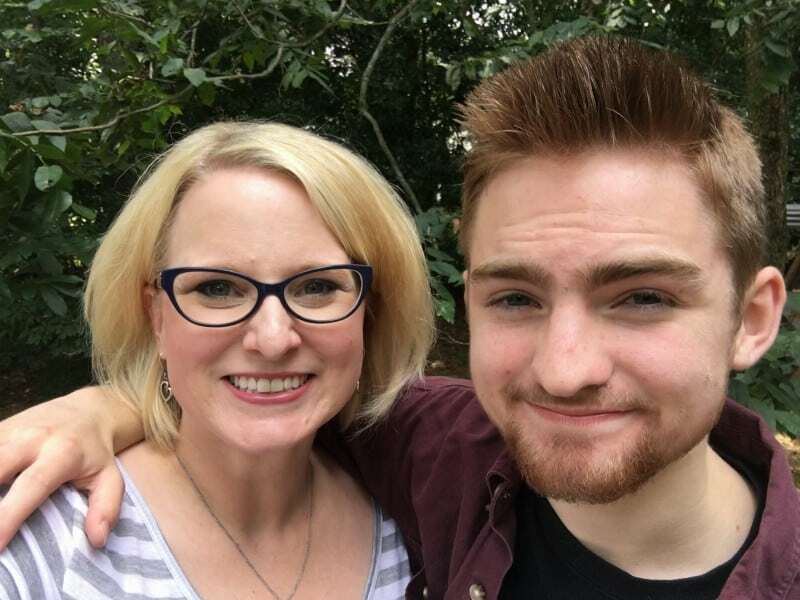 🙂 My son and I have similar personalities and often our communication with one another is a series of thoughts that we forget to say out loud. Oh, and guess what else is happening this week, besides my Brady turning 17? Today is Southern Plate’s 8th Birthday! So this most definitely calls for cake. 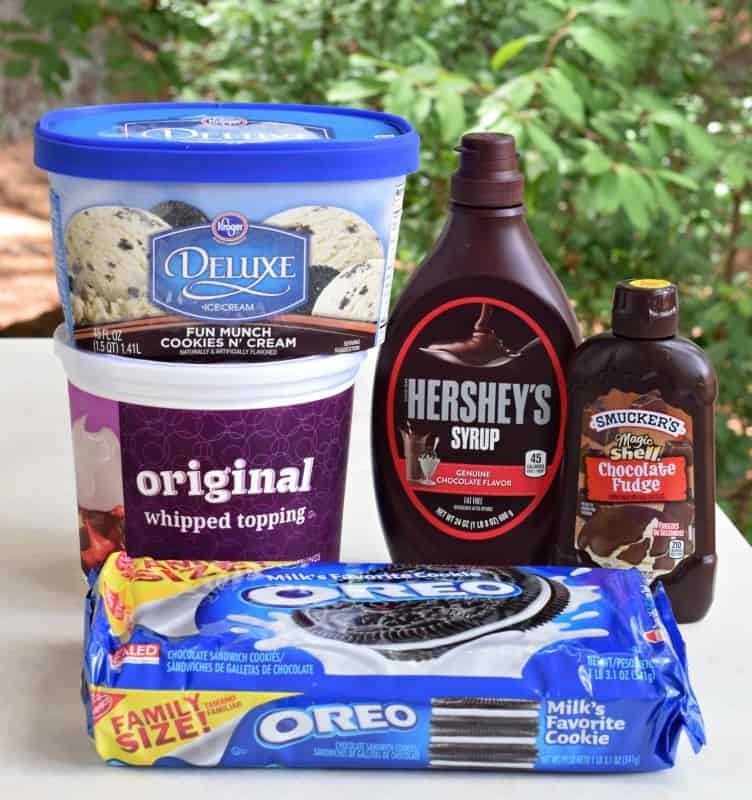 To make this you’ll need: Cookies and Cream Ice Cream, Large Frozen Whipped Topping, Hershey’s Chocolate Syrup, Chocolate Fudge Magic Shell, and a Family Size Bag of Oreo Cookies. Choosing an ice cream – I like Kroger brand deluxe ice cream. Choose your favorite but get the best quality that you can and make sure it says “ice cream” rather than “frozen dairy product”. **Y’all, clutch the pearls because this has hydrogenated oils in it. Yup. I know. Yes, you can make your own homemade whipped cream if you want. Did I? Nope. I used good old cool whip, generic at that. Now exhale. 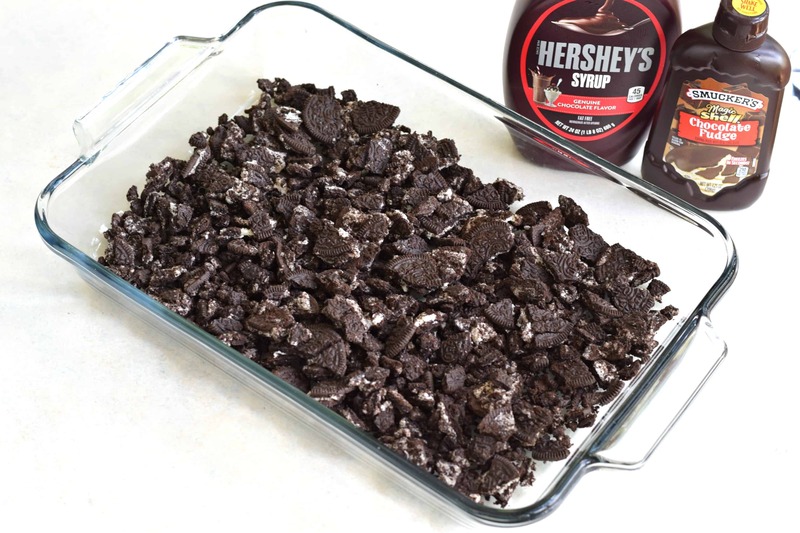 Coarsely crush most of the Oreos (save about ten for the top) and sprinkle them in the bottom of a 9 x 13 baking dish. Soften the ice cream by sitting it out for a few minutes and then spread it over the top. I do this by plopping spoonfuls all over the top and then smearing them together with a butter knife. Generously Zig Zag some Hershey’s Chocolate Syrup over this. Now spread the entire container of whipped topping over this. Press the remaining oreos into the top and then zig zag some magic shell over the top. To keep it looking pretty, place in the freezer for a few minutes uncovered, to allow the magic shell to harden, then cover and return to freezer until ready to serve. This is surprisingly easy to cut. Sit ice cream on counter to allow to soften. Set aside about ten cookies from the package. Coarsely crush or break the remaining cookies and spread them out in the bottom of a 9x13 pan. Spoon entire carton of ice cream over the top and then use a butter knife to spread it so that it is even. 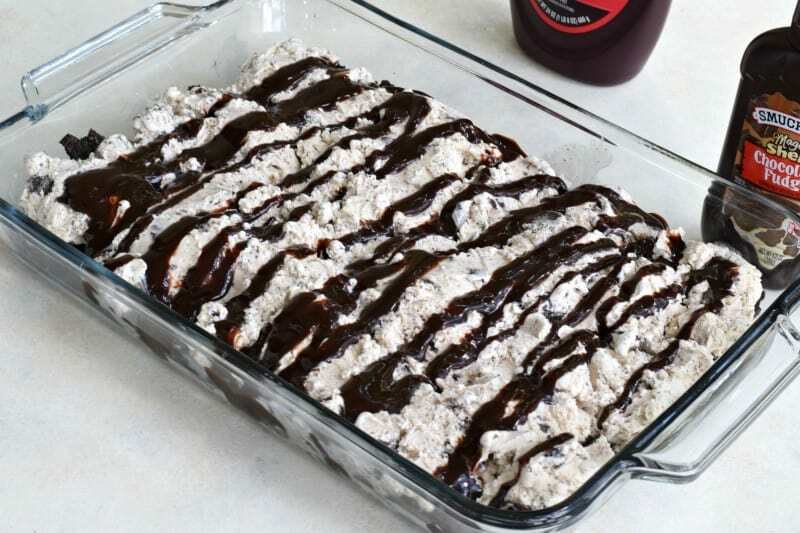 Drizzle a generous zig zag over top of ice cream with chocolate syrup. Top this evenly with entire container of whipped topping. Press reserved cookies lightly into top. Zig Zag over all of this with chocolate Magic Shell. Place in freezer, uncovered, until Magic Shell hardens. Once hardened, cover well with foil or lid and return to freezer until ready to serve. Southern Plate (8 years on July 8)! Thank you for being a blessing in my life and for the honor of allowing me to be a small part of yours. What a perfectly delightful recipe to celebrate not only Brady’s birthday and Southern Plate’s 8th birthday but today is MY birthday as well… 🙂 I’ll dream of making this on my next birthday and for this year I’ll keep to the low carbs… but 2017, you had better watch out LOL Blessed be your day. Happy Birthdays! Thanks for the recipe will have to try it. That list of ingredients is a sure winner!! Happy birthday to all and my thanks to you for this website. It’s a real blessing to me. Going shopping now so I can get this relish delight into the freezer. Happy birthday Brady. 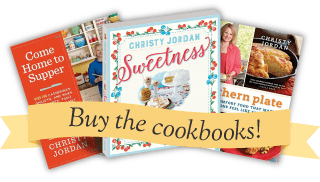 Happy birthday Southern Plate.Thank you Christy for all the encouragement,recipes,and sharing your family photos,just for every thing you do. HAPPY BIRTHDAY BRADY AND SOUTHERN PLATE! THIS CAKE LOOKS WONDERFUL AND WILL TRY IT THIS WEEK-END. THANK YOU CHRISTY! This cake looks so yummy!!!!! Happy 8th Birthday Southern Plate and Happy 17th Birthday Brady!!!!! Good grief, I cannot believe that little boy has grown up so fast.. time sure flies…he is a handsome lad and I know the light of your life.. Happy birthday, Southern Plate!! You’ve made a lot of people feel happy, comforted and loved, and you’ve taught us all to be better cooks and more kindly people. Y’all, clutch the pearls because I can’t have chocolate, but I could make it with blonde Oreos, I suppose, or lemon sandwich cookies-that’d be pretty good, but I don’t know what you’d use for the sauce-strawberry sauce? The simplest would be vanilla ice cream, speculoos cookies, and caramel sauce, which could be pretty tasty. My niece and I share a birthday, and they always visit on Labor Day weekend, and we celebrate it together early-but, she doesn’t like ice cream cake, which is a fly in my ointment, so I can make a mini one later in the week for just me. Thanks for the idea. I LOVE CARAMEL even more than chocolate ! 🙂 Happy Birthday! Make it just for you, you deserve it! Happy Birthday Brady and Southern Plate. Also, Happy Birthday to my hubby who is turning 60 this coming Monday. We live in Savannah, TN, which is just north of Pickwick Dam. We have friends who have a house there and they, a bunch of other friends from the Memphis area, and us are gathering together all weekend to celebrte. Wish I had this recipe when I was putting the menu together. It would have definitely been front and center. I will have it another time. Maybe for my Birthday, which is on the 22nd. Happy Birthday! My mother-in-law makes this with ice cream sandwiches, cool whip and magic shell. I like the looks of this version!! Since it is my birthday, too…I may just have to make it! Thanks for what you do. I sure do enjoy it! Happy Birthday to Brady and Southern Plate! Have a great weekend! Happy Birthday Brady & Southern Plate!!! I cannot wait to make this. Blessings to you and keep em coming!!! Yes please this is my kind of dessert cool whip and all ! Double happy birthday and thanks for all you share ! This Oreo dessert is always my children’s favorite dessert. In fact it’s their birthday cake every year. Happy Birthday to Southern Plate and to Brady. You continue to inspire us with your wonderful words of wisdom. God bless you as you continue in this journey. Happy Birthday, Brady! Happy Birthday, Southern Plate! Where does the time go? Can I come over for a piece of that lucious cake? *Brady shares a birthday with my now 2 yr old grandgirl, Aeris!! you would be correct as I love homemade whipped cream, but a few times a year, I just need me some cool whip! lol 🙂 Happy Birthday Aeris, what a beautiful name!!!!! I have made a version of this for about 10 years for our Christmas gathering. My 20-year-old granddaughter still asks for ‘the dessert’ every year. 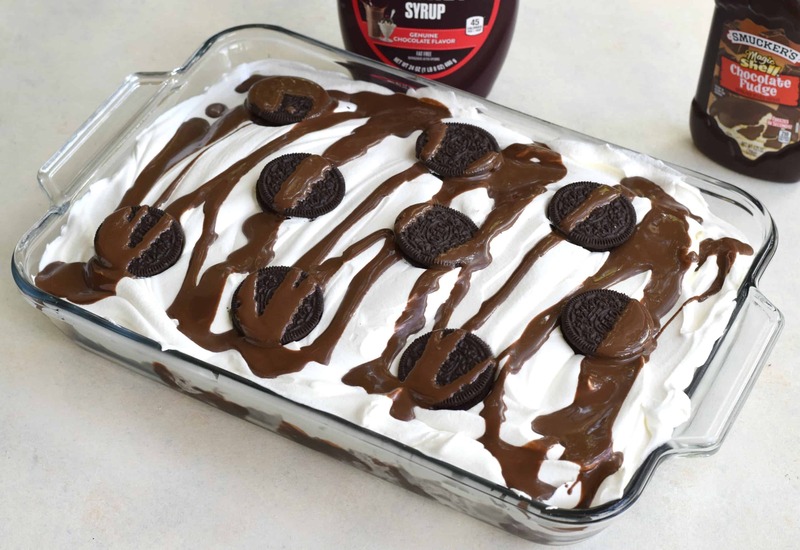 I make it with mint chocolate chip ice cream and a jar of hot fudge sauce in place of the Hershey’s syrup. I also crush those 10 Oreos for the top top. The Magic Shell…never thought of that, but now I am gonna have to try that this Christmas. Happy B-day to Brady and to Southern Plate. While I do not comment often, I read all of your posts, watch your videos and use your recipes. I appreciate your sweet spirit and wonderful sense of humor. Blessings to you and yours! Happy Belated Birthday Southern Plate! We share the same birthday. I’m just a” few” years older than you are. LOL This recipe sounds scrumptious. Will have to try it. HAPPY BIRTHDAY TO YOUR SON AND SOUTHERN PLATE .. HE LOOKS LIKE HIS MOM. SMILES.GOD BLESS. 🙂 Thank you Elizabeth!! Blessings to you!! Happy Birthday to Southern Plate and to Brady! I’ve only been enjoying your recipes, wit, and encouragement for about 4 years now…so sorry I missed the first half of the journey! Wishing you continued success and looking forward to following you even more closely on the new facebook page…Will definitely be trying this “birthday” cake at our family BBQ this weekend… we love everything CHOCOLATE! God bless you! Thank you so much Rita, I am so glad to have you as a part of the Southern Plate Family!!! Blessings to you as well! Two of the best things about Southern Plate: (1) Use what you have, don’t run to the store, and (2) suit the recipe to YOUR taste, not Southern Plate – just don’t change it enough to make it a totally different recipe. Thanks for showing us your faith, your family, and your wonderful recipes. Happy Birthday Brady. Wish I had been with Southern Plate from the beginning !!! I make this in a deep pie plate but am so glad to see it in the larger pan! This is what my family members request for each of their birthday cakes! It’s wonderful with mint chocolate chip ice cream, caramel pecan ice cream, and coffee ice cream, for certain. Probably tastes wonderful with any flavor ice cream. I’ve used the squeezable cake gel or frosting tube from the grocery baking aisle to write “Happy B’day, ___!” on it. YUMMY Cake-and most of the restaurants we’ve been to on birthdays will put it in their freezer while we eat if requested (I call ahead of time to make sure). We pack it in a plastic container and slide it into a soft sided cooler bag. Request it brought out as the meal is winding down. To make it worth your server’s while, take your own paper plates/bowls, plastic spoons, napkins, and a trash bag to collect your own family’s birthday ice cream trash. This also allows for festive looking birthday tableware. I usually tie the trash bag up and throw it away at home. And- the server ALWAYS gets a slice. It’s not easy to take it back home (more reason to share) but there’s usually not a piece left anyway-fam even scrapes the pan for the Oreo crust. Everybody wins!